There are no additional tests for the American Eskimo Dog that are not already included in a panel. Please select a panel or tests from the panel, or browse the tests found in breeds related to the American Eskimo Dog. Please contact us if you cannot find the test you are looking for. There are additional tests from breeds related to the American Eskimo Dog. The breeds we know today have been selectively bred for from a few common ancestors. Breeds that were derived from common ancestors constitute a breed group. Because a breed group is genetically related, mutations and diseases in ancestors or within a breed put all breeds within that group at risk for the same inherited disorders. Therefore, we have provided you the diseases that occur in common ancestors and related breeds so that you can decide whether you wish to also exclude these diseases in your dog. 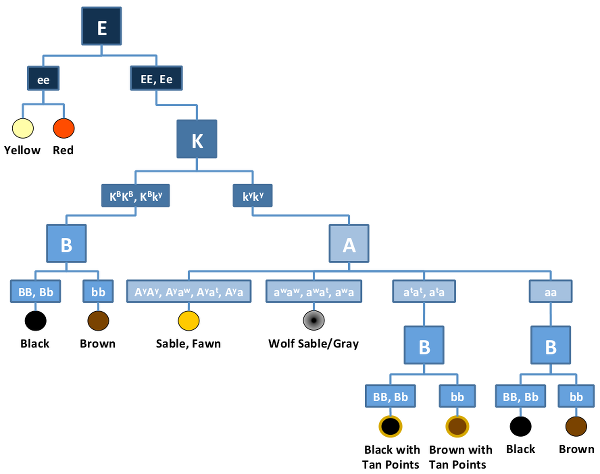 Paw Print Genetics offers testing for common coat colors and traits. Some genes have more than one mutation, such as those genes involved in Agouti and determining a brown coat color. The tests for those variants have been combined for simplicity in ordering. To learn more, just click any of the coat color or trait names below.